So fashion week may be over, and fashion month a thing of the past, but the memory lives on and the fomo too. Wouldn't it be nice to be able to jet around the world for every single Fashion Week, and then jet back home with a wishlist brimming full? Goals. 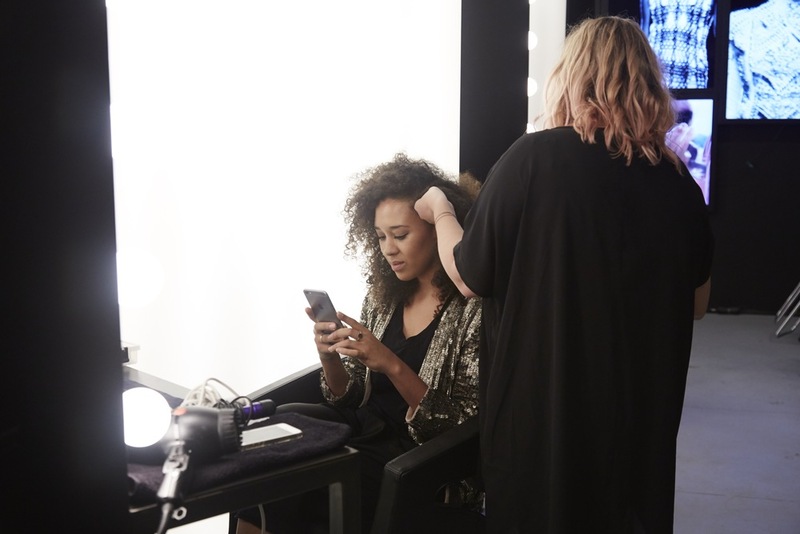 This year, I was lucky enough to be invited to the TresEmme Professional Hair Care Studio set up as a fashion week activiation. Spring Studios produces and hosts large-scale events for brands including Google, Microsoft, the Vogue / CFDA Fashion Fund Awards and the Tribeca Film Festival within it's 150,000 square foot state-of-the-art event space in Tribeca. Spring New York is also the home of New York Fashion Week, housing shows for Calvin Klein, Michael Kors, Versus Versace, Opening Ceremony, DVF, Altuzarra and 3.1 Phillip Lim. For their clients, Spring creates, plans and produces scalable events with content creation at its heart – collecting, curating and distributing brand and social content – before, during and after the event. 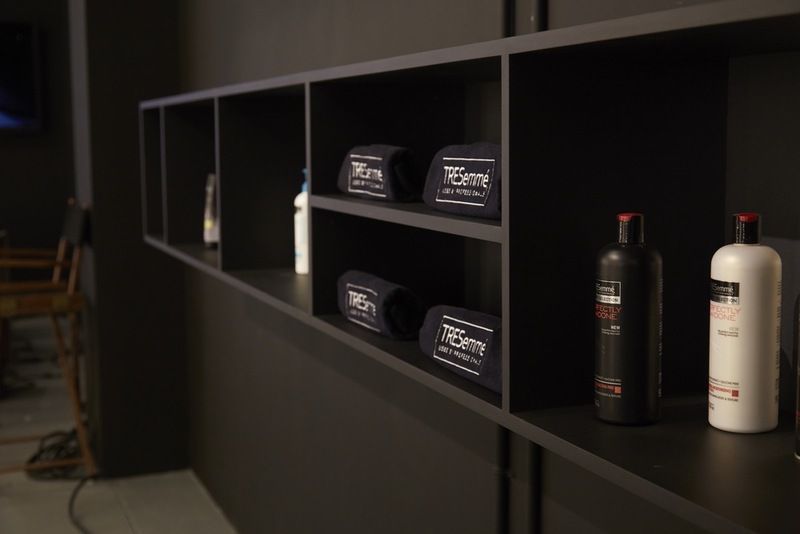 The activation was a double volume white space room covered in mosaic tv screen displays streaming runway shows and behind the scenes footage from our favourite hair care sponsor. It was still pretty blistering cold outside, so the warmth and fresh coffee was a much needed relief, needless to say I made myself at home. Everyone was extremely friendly and talked me into a chair and in front of a mirror without me even noticing! Now the point of this studio ladies and gents, was to provide a touch up place to freshen up in between the hustle and bustle of the runway shows, and should you choose, try out a fresh new do courtesy of the team of specialists. You guys all know my hair has a life of it's own, I looked up at my hair stylist Claire apologetically as she stood in front of the mammoth task (my fro) in front of her. 'We got this' she said....okay Claire, you got this! She expertly managed to braid a super cute corn row plait into the side of my hair, and left the other side curly, 'it's the beauty look Diane Von Furstenburg featured in her FW'15 show' Claire commented. I can work with that! Hey if it's good enough for Kendall Jenner, It's sure as hell good enough for me! I looked up and you know what? It was actually pretty cute! I was expecting the usual tug and pull of white woman against black natural hair, but Claire had mad skills! She fought through the curls very gently, and I must say, I was quite impressed. She used their all natural range of products with Almond and Jojoba Oils for maximum shine and moisture without weighing down my curls. I must say, I'm grateful for the extensive range of products they had on hand, as we all know, products don't always translate well across hair types and textures, especially with the wide variety of natural hair textures black women are blessed with, but Claire had me covered, I use the TresEmme Naturals shampoo and conditioner, so I feel right at home. Team TresEmme had put together a great photoshoot set up, for after your runway look is complete. Who doesn't like a live photobooth? So of course I jumped in. My photographer Shen taking pics of their photographer Ben taking pics hahahaha it was a lot of fun. Thank you TresEmme for the brief spot of pampering in between the craziness. It felt really good to be fussed over, even if only for a little bit. To all you guys, don't forget TresEmme is still running that awesome competition where you could win a trip to New York Fashion week (and hang out with me). All you have to do is buy any TresEmme product (I'm keen to give the new Platinum Strength range a try, winter did a real number on my hair, the damage is so stressful), keep your receipt and enter your details on the website! Take a picture of your product, post it on social media and tag me @KennyJMW and @TresemmeSA and use the hashtag #TresemmeTakesNYC! Voila!